Wonder why they leave outdated signs on buildings long after the occupants are gone. Is Walmart planning to open another Albany branch in the vacant Mega Foods Building? A reader thought that might be happening, but it’s not. Prompted by the reader’s inquiry, I took a ride past the former supermarket off Queen Avenue near Geary Street on Wednesday. I met a nice young man, Gabe Shearer, 18, who was wearing a Walmart name tag. This was his first job, and he was taking a break outside. I confirmed what he told me with Pam Rushing, the leasing agent with Coldwell Banker Commercial whose name and number are posted on the side of the building. If you live on the west, north or south sides of Albany and like to shop at Walmart, the Mega Foods space would be a lot more convenient for you than the superstore way on the other side of I-5. But the Walmart crew working there expects to use the Queen Avenue site for only three to four months. After that the store will be vacant again unless Pam Rushing can find a tenant by then. 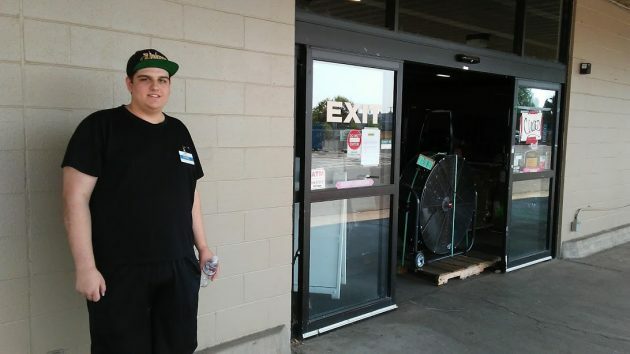 Walmart employee Gabe Shearer takes a brief break outside the former Mega Foods Wednesday. We definitely need another Walmart. Particularly during the Summer months. The Walmart on Goldfish Farm Road has its entire parking lot posted “No Overnight Parking,” yet on any given morning (summer is the most intense) the Walmart parking lot closely resembles a KOA campground near Yosemite. On the Labor Day weekend, we saw that a convivial motorhome owner had pitched a tent on the asphalt so the kiddos could have that genuine outdoor camping experience. If there were another Walmart over at the Mega Foods site, some of this Camping Business could be routed to the new site, thus allowing more trailers, motorhomes, 5th-Wheels and crumbling U-Haul truck/camper Conversions to experience Albany parking lot joy. I urge the City Council and the Albany-Millersburg Economic Development Squad to get out there and promote this concept. Make Albany Great Again. Aren’t you clever. At least we know that you think you are. You have never been poor, or, if you have, you no longer are and have conveniently forgotten leaner days. If they do build/open a second Albany store, it would be nice to have some kind of shopping on the West side. Similar to the one in Corvallis would be great. It has been way too long without a Westside grocery. It would definitely help reduce traffic to the grocery hub area. An IGA has been open for awhile in the spot formerly Ray’s. Clean, well-lit, with a helpful and friendly staff. Prices slightly higher than the biguns across the river. Meat packaging seems aimed at a household of two. The floorspace for the deli is a large part of the building. Smells great. And, there’s an ACE hardware in the building. Used it for a few “dang it I need this piece” projects. If you live on the “town-side” of the river, why would you want to brave the congestion of getting across the bridge to IGA and then back to your side of town….especially for “not lower” prices? 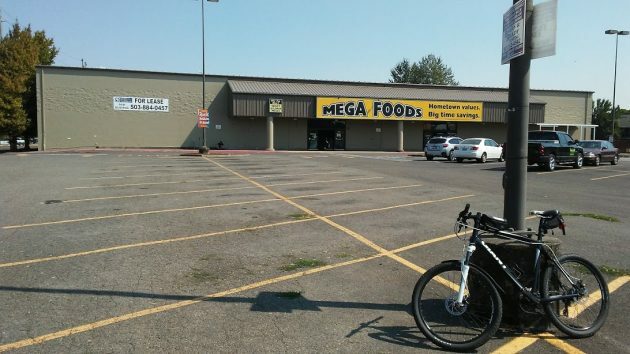 Yes, a small Walmart like the one off 9th Street in Corvallis would be great at the Old Mega Foods location. The Corvallis Walmart was a nice, dimly-lit, quiet store when it opened. They had a few unique or cheaper items. Then they started playing horrible music like everywhere else except Winco. I seldom shop there now. Why do we have to have such sarcasm? The world is bad enough without it. It should become an ice skating rink. Is that a car-charging station at WM? How did Goldfish Farm Road get its name? Yes, it is a charging station. City issued a permit for it a year or two ago. Goldfish Farm Road is called that because once it went past a –you guessed it — goldfish farm. The D-H wrote about this some years ago. Maybe you can hunt down the story by searching for it on the paper’s website. A “green” Walmart would have been nice. I recollect WM abandoned the concept. Instead, a regional outfit has put money on the table. Now we wait to see if North Albany accepts their design. This is the 3rd attempt at a grocery.